As I mentioned in a previous post, the Upland Equation blog contributors have already and will continue to share book reviews on various sporting books we read. Most recently, Walter did a great review of John Hightower’s book, Pheasant Hunting, which is one of the Borzoi Books for Sportsmen published by Alfred A. Knopf. In this book review, I will address another Borzoi Book, entitled Upland Game Shooting by H.L. Betten which was first published in 1940. I will start by proclaiming that this book is a classic which should be in every sportsman’s library. Betten can easily hang with the likes of Burton Spiller, Ray Holland (who Betten was personal friends with), George Bird Evans, William Harnden Foster, and Corey Ford. However, with the exception of Ray Holland and Corey Ford, Betten was more traveled than most of these other gentlemen and hunted upland game birds throughout the United States. In Upland Game Shooting, Betten writes about hunting most of the North American upland game species, including those of the west. Thus, for a western bird hunter, his writing hits close to home and still rings true today. My favorite chapters are on the Dusky Grouse and the Sharp-tailed Grouse. 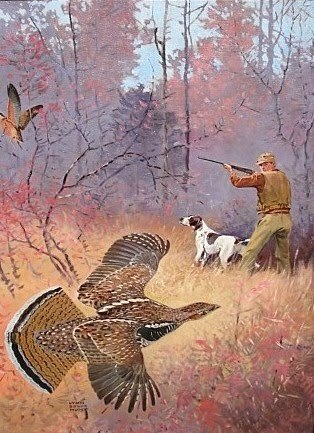 Grouse and Woodcock Hunting painting by Lynn Bogue Hunt. As with Burton Spiller’s books, Lynn Bogue Hunt, one of the foremost outdoor artists of his time, was the illustrator and the book contains numerous beautiful black and white drawings as well as nine spectacular color plates depicting the pursuit of the different game birds addressed in the respective chapters. The gorgeous artwork is just the icing on the cake. 1. The renowned author Mark Twain (Samuel Clemmons) was a bird hunter, but according to Betten’s uncle, was a “punk shot” and could not hit valley quail to save his life. 2. Although not much of a bird hunter, George Washington publicly confessed his love of hunting woodcock. 4. Betten writes about the hunting the first opening day of the first pheasant season in the Willamette Valley of Oregon. He was actually there! For those who don’t know, this was the very first hunting season ever for pheasants in the United States. These are just a few of the gems shared in Betten’s book. As the season advances and temperatures fall, the prairie sharp-tail becomes semi-migratory. That is to say the birds develope a strong inclination to leave the comparatively bare plains and to take to brushy coulees, rolling hills and tree “claims” instead. But even in late September, they will be found in such resorts. . . . It was the fringe of such terrain that Harvey and I hunted. At that time, too, deciduous growths are in the sere and colorful leaf and I’m telling you such a stage setting enhances the sport marvelously. I don’t want to preach or ram personal doctrines down your throat. But if you find nothing inspirational in such scenes, . . . turn to some other other recreation and don’t clutter up this field in a cold-blooded, meat-hunting way! Sharp-tails are not plentiful enough to be wasted like that. When one has engaged actively in field sports for almost six decades, countless sporting adventures come to mind. Naturally, out of the many only a few can be mentioned in a book of these dimensions. Also, but a limited number of the hundreds of the hundreds of fine sportsmen it has been my privilege to meet in this beautiful old world, of the countless sterling gun dogs it has been my pleasure to know. Together they have afforded many a grand day afield; if the Great Architect had given me little else in the way of joy, life was still worth living on their account alone. Clearly, Betten understood that hunting buddies, bird dogs, beautiful surroundings, and memories all contribute significantly to a hunter’s happiness. Finally, to all good sportmen who love field sports, fine guns, and the companionship of man’s best friend, my sincerest wishes for long future enjoyment of that grand recreation, Upland Game Shooting. Obviously, he was talking of our grand sport, but this also equally applies to his great book. The two truly go hand in hand. As I said earlier, this book is a real classic. Great post Andy! Betten is certainly one of my favorite authors! I wish he would had written more books! One of my favorite books. I got my first copy over 40 years ago and read it eagerly. When I started hunting again in 2008 I had to find another copy on the Internet since mine had gone away. I re-read it and enjoyed it all the more. Recommend it highly. Thanks for this article. It is always good to read a review and learn what is out there in the ways of books on these topics. I love hunting upland game birds, and always enjoy reading of others adventures doing the same. It is a shame though you find very little to read in this area, at least compared to big game hunting, or fly fishing. But nothing beats upland game hunting. You should consider sharing this review with Amazon.com, this review and any other you might have. Henry Betten is my great grandfather. I am moved to read such praise of his writing in this era. Thank you for featuring his work. Mark, thanks for your comment. HL Betten is one of my favorite writers. His work is under appreciated for sure. Hope his family still carries on the upland hunting traditions! Truly a great book written by a very knowledgeable man who really knew his upland birds and experienced upland hunting at its peak . I would like to find some more written by him and a little history of the man. Better is a great writer. Wish we had more from him. I believe Worth Matheson wrote an article about him, but I don’t remember where. I believe that George Bird Evans also wrote about Betten in one of his books.